The stats don’t lie regarding this fixture, as all Chelsea fans know, we often beat Spurs at Three Point Lane and of course Stamford Bridge. The record reads, 29 games unbeaten, this stretches back to the old First Division and of course the Premiership. 17 of these had come at Three Point Lane where Spurs hadn’t beaten Chelsea since 1987. The best victory for Chelsea amongst these games at Spurs came in 1997, when a Tore Andre Flo hat trick buried Spurs 1-6. Last season we travelled to N17 and beat Spurs 0-1 thanks to a goal by Jimmy Floyd Hasselbaink. This season Spurs came to Stamford Bridge and ‘parked the bus’ in front of the Chelsea goal as they defended for most of the 90 minutes as the game ended 0-0. An effort from Eidur Gudjohnsen hit the post but we couldn’t break down the stubborn Spurs defence, who were managed at the time by Jacques Santini. Today, after our efforts in midweek against Man Utd in the Carling Cup Semi, Jose made five changes to the team that travelled to Three Point Lane. Petr Cech came back to claim his regular Premiership spot ahead of Carlo Cudicini. In defence Paulo Ferreira moved to left back to replace Wayne Bridge and at right back in came Glen Johnson. In midfield Alexey Smertin replaced Tiago as he’d picked up a slight ankle knock in the game against United. In came Arjen Robben up front, he was suspended for Wednesday evening. Alongside Robben came Didier Drogba who replaced Eidur Gudjohnsen. Spurs had been going through a decent run recently under Martin Jol and had been unbeaten in seven games. 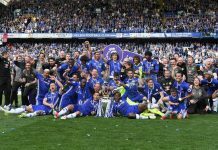 As we all know Chelsea have been unbeaten in the Premiership ever since our only defeat this season away at Man City in October, so if one team were to win then an unbeaten record would be sacrificed. Jol had said that he would play very attacking football to try and end the magnificent run of Chelsea games against Spurs, but as we all know our defence had only let in eight Premiership goals all season, so Jol would have his work cut out. In the early minutes of the game it was Spurs who had the upper hand, a cross by Pedro Mendes to Robbie Keane went wide of the Chelsea goal, but soon after we gained our first corner of the game. Claude Makelele won the ball and crossed to the impressive Damien Duff who’s shot deflected off of Ledley King, the resulting corner was cleared but it showed Chelsea’s intention in a game they wanted to win especially after Man Utd defeated Liverpool 0-1 at Anfield earlier in the day. In the 8th minute we won another corner, Super Frankie Lampard played the ball out to Arjen Robben who’s shot came off of Naybet, again unfortunately nothing came of the corner. The early part of the game was played at a frantic pace going from end to end as both teams wanted to end the others unbeaten record. Spurs had a chance in the 20th minute to go ahead. Michael Carrick the former West Ham player played the ball from midfield to another ex-Hammer Jermaine Defoe, he cut past Glen Johnson yet another former Hammer and shot at Petr Cech, he could only parry the ball and it went out for a throw in. Both teams were dangerous and with referee Graham Poll in charge, who incidentally was in charge when we played Arsenal at Highbury this the last time we’d conceded goals in the Premiership anything could happen. On the half hour it was our turn to take advantage and to start playing the more constructive and better football. Glen Johnson went marauding down the right his cross-found Damien Duff who’s shot was turned round the post for a corner. Again the corner didn’t develop into anything but we were looking dangerous. A few minutes later we had a penalty appeal turned down. Arjen Robben was clipped inside the penalty box by Pamarot, the defender went down with Robben but Poll in all his wisdom and a long way from play gave the goal kick much to the disgust of the Chelsea players, Jose Mourinho and everybody on the Chelsea bench. In the 39th minute a penalty was awarded however, was it to make up for the previous incident? Whatever it was, Smertin went down in the box under the challenge of Michael Carrick. Damien Duff had managed to keep a difficult ball in play, crossed and Smertin running into the box went down under the challenge of Ledley King. This time Poll was closer and was spot on to give the spot kick. This was our only penalty away in the Premiership since we beat Spurs at Three Point Lane in 2002, that day we came out victors 2-3 with Marcel Desailly scoring the winner in the 94th minute. Jimmy Floyd Hasselbaink had slotted the penalty away that day, today it was Frank Lampard who stepped up and coolly slotted the ball past Robinson. 0-1! Super Frank ran to the contingent of the outstanding Chelsea away supporters kissed the Chelsea badge and celebrated in true Frankie style. Just before half time Glen Johnson who had an outstanding game got booked, but this didn’t detract from the first half, which had a truly magnificent atmosphere, however for the six minutes left before half time it was the Chelsea fans you could hear singing and celebrating. The second half started with Spurs on top, they were obviously trying to get a quick equaliser, it seemed as though Jol had given them the go ahead to attack at will. However, our defence as per usual were rock solid with both JT and Gallas blocking shots and defending like Trojans. With their attacking spirit they nearly equalised from a corner as it was whipped in and the ball went straight across the face of the Chelsea goal. This really was their best chance of the game. After this Chelsea began to dominate, on the 75th minute mark Eidur Gudjohnsen replaced Didier Drogba and with 79 minutes gone Joe Cole replaced Damien Duff. With injury time the only thing stopping a Chelsea win, Eidur set up Frank Lampard after he headed over Naybet, he crossed the ball back for Frank and this was game over. Frank blasted the ball past Robinson and the two defenders on the line, 0-2! Frank again wheeled away and celebrated, as did the Chelsea fans. It was a win worth savouring as 29 turned to 30 and we’re still counting. With Arsenal playing at 5.15pm at the Reebok Stadium against Bolton we were 10 points ahead, could Arsenal cut it back to seven? Well, at the final whistle at the Reebok Bolton were the victors beating the Gunners 1-0. So, we keep our 10-point lead over our London rivals. If this isn’t a sign of Premiership champions I don’t know what is. Who said we were going to have a blip Mr Wenger? For all Chelsea fans, look at the Premiership table and savour it. In my lifetime I’ve seen Chelsea top of the old first division and the Premiership, but 10 points ahead? 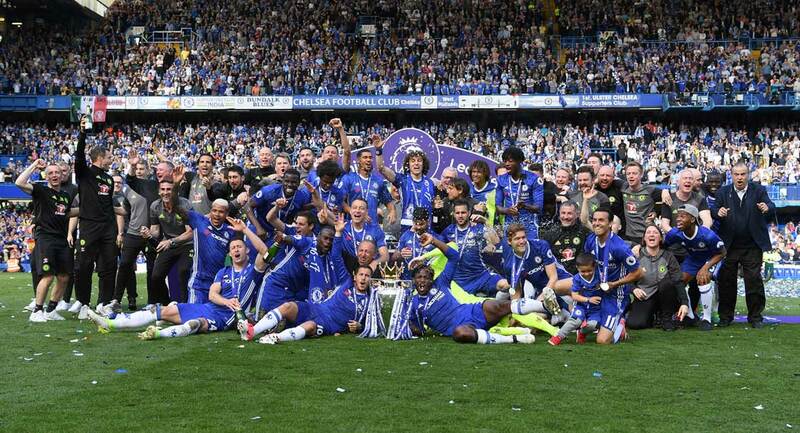 The title is on its way to SW6! Tottenham: Robinson, Pamarot (Marney 71), King, Naybet, Edman, Brown, Pedro Mendes (Yeates 78), Carrick, Ziegler (Gardner 67) Keane, Defoe. Subs Not Used: Fulop, Kelly. Chelsea: Cech, Ferreira, Terry, Gallas, Johnson, Makelele, Lampard, Smertin (Jarosik 70) Robben, Duff (Cole 80), Drogba (Gudjohnsen 76) Subs Not Used: Cudicini, Bridge.